VueOps gives you situational information at your fingertips to better manage your facility. With VueOps, you can access building intelligence from design and construction for use in building operations and maintenance. VueOps provides a data integration platform as an important step towards the goal of digital transformation to maintain and manage smart sustainable buildings. You have paid for data from design and construction. We help you get the most value out of it. 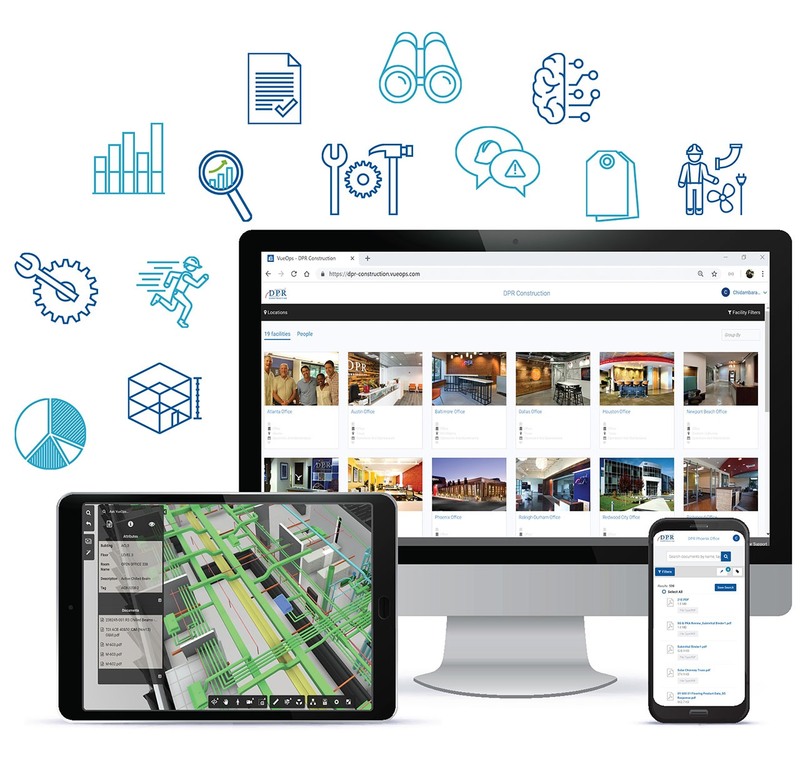 We understand building data for facilities management, and create toolkits to transform design and construction information into building intelligence. VueOps plans and executes strategies to keep your building's dataset accurate and up-to-date as renovations and repairs occur. VueOps connects project documents, asset data, models, and spaces with minimal effort to maximize your facility up-time and helps you answer the time critical questions of “what” (assets), “where” (space, floor), and “how” (how to access, tools required). VueOps integrates with your lifecycle management tools to provide your facility engineers with accurate, detailed, situationally relevant information. Through our integration partnerships, VueOps harmonizes the flow of asset data into your CMMS to ensure your facility is running optimally on opening day. Our team includes architects, builders, construction project managers, startup founders, computer programmers, BIM and CAD experts, and AR/VR/laser scan specialists – all working to create the future of the built environment. Construction is an investment in the future. While the walls and floors are part of that investment, so are the complex systems that keep your building operating efficiently. VueOps adds value to your investment by making information management intuitive. Access building information from anywhere, anytime on our cloud-based platform. Virtually investigate building issues using 3D BIM before deploying labor to the field. VueOps works for one building or an entire network of campuses, increasing operations efficiency at every level. Are you ready for Building Intelligence?